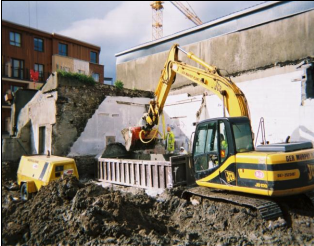 The site in Waterford, Ireland was being developed as one of nine David Flynn apartment blocks comprising of three storey apartment blocks together with associated parking facilities, access roadways and general landscaping. The history of the site was as a spray painting and panel beating workshop. Historical use resulted in widespread soil contamination across the site. During initial earthworks development, extensive and unexpected ground contamination was identified. Site investigation indicated the presence of shallow made ground with a thin layer of sand and gravel which were contaminated with hydrocarbons up to a maximum depth of around 3m across the whole of the site. Elevated levels of Total Petroleum Hydrocarbons (TPH) were identified within the made ground and perched groundwater. As construction had already commenced the main contractor required a rapid remediation technique in order to minimise disruption and maintain project viability. The remediation strategy for the Anne Street site was designed to address the source contamination onsite and indirectly the pathway contamination issues, with the intention of protecting Human Health and the identified groundwater receptors. A number of proven remediation techniques were considered for the site within the framework of specific constraints. Each technique was assessed against the specified constraints to identify the one which gave the best performance overall. Only stabilisation / solidification with Envirotreat E-clay® was found to meet all the constraints. The modified organophillic clay was designed on a site specific basis prior to the commencement of the remedial works. Rapid Bench and site trials were an important part of the design process. The remediation strategy employed on-site by Envirotreat for the treatment of over 800m³ of contaminated soils was ex-situ soil mixing. The works were conducted over a 2 week period under the auspices of Envirotreat’s Mobile Process Licence (MPL). Specialist technology, materials and supervision were supplied by Envirotreat, whilst FLI Environmental supplied all the required plant, and labour for application of the Envirotreat® Process.